Leash training is one of the most frustrating parts of dog training. It takes a lot of time and patience. Depending on the dog's age and energy level, this part of training may take weeks of consistent work to master. These resources for leash training will help get you started and give you some great information about training puppies and adult dogs. No matter what type of training that you're doing, it's always easier to start with a puppy. They haven't developed any bad habits yet, so it's easier to just train them the right way the first time. Of course, it's never too late to teach an old dog new tricks – it will just take a little more time and patience. Whether your dog is an energetic Labrador or a lazy Bulldog, you need to remember to walk your dog, don't let your dog walk you! Teaching your dog to behave on a leash will not only make life easier for both of you, but you'll reap the rewards of this training throughout your pet's entire life. I've taken the time this week to comb through a lot of the information available online, and I've found these 9 resources for leash training that offer the best tips and tricks. If you're working with a puppy, you're starting from scratch. Your puppy knows nothing about the world of being a domesticated dog. Schedules, routines, puppy supplies and training are all new to your furry friend. You'll need to start from the very beginning. Kathy Diamond Davis is a dog trainer, and she also wrote this article for VeterinaryPartner.com. It includes a lot of beneficial tips for leash training a puppy and also gives you some technique approaches that may work with your Fido. Each puppy is different. Pups have different things they like best, and different things they respond to in different ways. You can build your puppy's desires to interact with you by how you use your praise, treats, petting, and the games you and your puppy play together. All of this factors into your leash training as well as all other training, both in puppyhood and later. In this article, author Liz Donovan points out the importance of starting your training inside your home. I know it doesn't make much sense to train your dog to walk on a leash inside, but it's actually much easier for your dog to begin this way. Your dog is already used to your home environment, so there will be fewer distractions while he's learning the basics of leash training. Now your puppy understands how to come to you, practice walking a few steps in a room with little distraction. Feeling and seeing the leash around him will be enough of a challenge. Offer treats and praise as your puppy gets used to coming to you, as described above, with a leash on. Dog Breed Info Center has a lot of great resources for dog owners that aren't related to a pets breed. I found multiple resources for leash training on their website, but this post is definitely the most informative. It covers everything you'll need to know about leash training your pet, whether he's a puppy or an adult. When a human allows a dog to walk in front, they are sending signals to the dog that he is leading the human. Instinct tells a dog that the leader goes first. A lack of exercise allows the buildup of the mental energy which would otherwise be released in a proper walk, and permitting a dog to be pack leader can cause many behavioral problems in a dog—such as, but not limited to, hyper-activity, neurotic and/or obsessive-compulsive behaviors—all of which are signs of a dog that is not mentally stable. As with all other types of dog training, you should NEVER use any type of physical punishment when your pet isn't behaving while on a leash. Yanking on the leash can do a lot of damage to your pet's neck and throat. Choke collars and prong collars can also be physically harmful. One great way to correct your dog if he isn't behaving on his leash is to turn around. I know it sounds simple, but it's actually a punishment. If your pet can't go the way that he wants to go, he'll quickly learn that he needs to behave in order to have more freedom. As this article on GreySave.org explains, this method of correction forces your dog to focus on you. To use the turn method, simply walk and any time the dog starts to step in front of you, turn sharply. Turn into the dog, blocking his path, or turn away from the dog, correcting him so he follows you. Sometimes you may even do a 180 degree turn. The frequent and sudden changes of direction force the dog to focus on you. 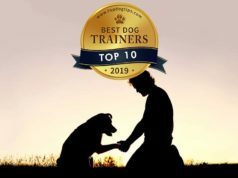 Victoria Stilwell is a very well-known professional dog trainer, and her site is filled with great information and resources for leash training. No matter what you're trying to train your dog to do, you will surely find some great tips and tricks on this website. This post is focused on loose leash walking. 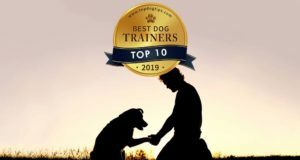 Another well-known dog trainer with a helpful website is Grisha Stewart. On this site you'll find articles and videos that are designed to help you train your pup effectively. Not only will you learn how to leash train your dog by reading this article and using the sited resources, but you'll also learn some fun games you can play with your dog while he's on a leash. Leash pulling is definitely the number one issue that dog owners have while trying to train their pup to walk nicely beside them. Not only is this bad habit annoying, but it can also cause serious physical pain to your pet. Using a harness may help, and there are many no-pull dog products on the market, but the best way to ensure your dog's safety is to train him not to pull. If your dog pulls and also lunges or barks at them, he may be showing signs of Leash Aggression, which stems from being under-socialized. Socializing your dog is an extremely important and essential part of raising a well-rounded and mentally healthy dog, so you should consult a professional trainer about how to safely socialize your dog if they are already showing signs of aggression. Did you know that the way you hold the leash can also help control pulling? I didn't either until I read this article from YourDogsFriend.org! There are many “right” ways to hold a leash, but this article sites one specific way that seems to be quite common with professional dog trainers. Every instructor teaches slightly different ways to hold a leash, but this is one effective way to do it. Put your hand palm up in the loop with your thumb outside; then, grab the leash farther down, without making it too tight. A tight leash tells your dog that there’s something to be anxious about, and it doesn’t teach him anything. At the same time, hold your leash hand steady against your belly and keep it there. If you have a very strong dog, you may need to hold both hands on the leash at your belly. Finally, this week I'd like to leave you with this article from the Animal Humane Society. It discusses how to manage a leash-reactive dog. It explains how to tell the difference between traditional aggression (which happens frequently with many different triggers) and leash aggression (which only occurs when your pup is on a leash). You need to take any form of aggression in your dog very seriously! Don't simply take advice from other dog owners. You need to do some research, and I would advise you to work with a professional dog trainer for safety reasons. Following the advice of inexperienced people can lead to a very scary and dangerous situation. Many people are advised to “correct” their dog for any perceived display of aggression. Some, in addition, force their dog to sit or lie down in the approaching dog’s path (while correcting) to “put him in his place.” This can be very dangerous for several reasons. First, Fido is learning that other dogs (and potentially other people) are bad news: Fido starts out feeling stressed, cannot escape because of the leash, and is then punished by his owner. Previous articleInterview: How to Choose the Best Dog GPS Tracker?